Once again, Elite Fighter, Vincent Martin won the XCC (Xtreme Cage Championship). The venue was located in Mbrio Beerhouse on 12th April 2015. Although he get this fight on very short notice, 5 days prior to the fight, he managed to make the weigh and lost 4 kg in 2 days! He finished the fight with RNC (Rear Naked Choke) on round 1. He showed us what a true fighter is. Check out the full fight on Elite Training Camp Official Youtube Channel https:/youtu.be/IGDv1UlRZtc Subscribe to follow his MMA journey, guys! 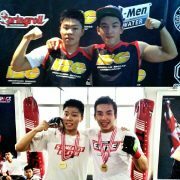 On 7th December 2014, Elite’s fighter, Vincent Martin and Setiono Ang, competed in Indonesia Badass Championship. Both were very prepared for the match. They trained 5 times a week and learn from the best. Setiono fought against Aldo from Dogo Argentino. He beat him on second round with the amazing Arm Bar. You could watch the full length video of his fight in our youtube channel and don’t forget to subscribe. Not to mention that he pretty much dominated the cage. With so many takedown and ground & pound, the crowd just can’t help but cheer for him. Setiono, we’re very proud of you and can’t wait for another victory!! Vincent Martin fought against Winson from Maximum MMA. Although there’s a slight problem on the day of the weigh-in, regarding his opponent approx. 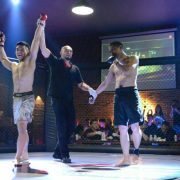 2,4 kg heavier than he should be, Vincent’s beat him to pulp and finish the opponent by flattened him to the mat and tapped him out with the smooth Rear Naked Choke. Watch the full length video in High Definition in our official Youtube channel and don’t forget to subscribe. Check out Elite Team in Indonesia Badass Championship pictures in our website gallery. She won the Indonesian Submission Championship 2014 tournament. We are proud of you. Indonesian Submission Championship 2014 is back. It was held at Cilandak Town Square. Elite Brazilian Jiu Jitsu fighters always participate and compete in most BJJ competition. This time Leo Krishna, Gabby Mellysa and James Japriadi competed and represented our team. 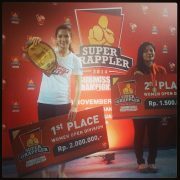 Gabby, being the Winner of Bandung Super Grappler 2014, became the Indonesian Submission Champion for Women open division. We are proud of you and your Champion belt suit you very nicely!! We open Elite MMA Shop booth on the event and offered special discounts on the day. So dont forget to follow our social media for the latest update and to know where we will open our next Elite MMA booth.